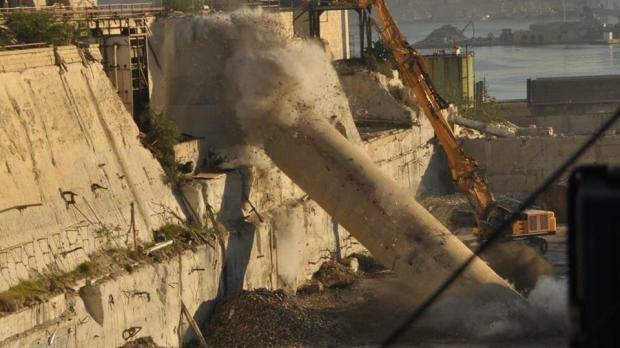 The last two of the Marsa power station’s five chimneys were demolished on Thursday morning with a roar that was powerful enough to be recorded on the University's seismic recorder. The chimneys were among the few remaining structures of the 1953 Marsa Power Station, which was put on cold standby in 2015 and fully disconnected from the national electricity network to be demolished earlier this year. The site is expected to be completely cleared in the beginning of 2018. During Thursday’s operation, the company’s contractors used a high reach demolition excavator and remote-controlled excavators to remove a section of the base of the two chimneys. As the excavators cut their way through the circular foundations, the structures gave way, tilting forward in a pre-defined direction and crashed to the ground. Mounds of wet debris were placed along the path of the taller chimney’s fall, to absorb the impact. The first structure to be demolished, a 42-metre concrete chimney, was built in 1970. It formed part of the first extension of the Marsa B Power Station, which included two HFO-fired boilers and two 30-megawatt turbines. The second chimney that was pulled down on Thursday was part of the 1986 Unit 8, the largest electricity generator of the Marsa Power Station, which was switched off for the last time in February 2015. This unit included a dual-fuel (HFO/coal) boiler and a 60-megawatt steam turbine, which was brought to Malta from a power station in Little Barford, Bedfordshire, England. At 81 metres above ground level, this 5-metre wide concrete chimney was the tallest structure of the Marsa Power Station. The highest structure on site, however, was the 69-metre steel stack of Unit 7, which was situated on higher grounds a few metres away. This chimney was dismantled earlier this year, along with other structures of the Power Station. Ing. Fredrick Azzopardi, Enemalta chairman, thanked the Company employees and contractors who planned and implemented the decommissioning and dismantling of this old power station during the last few years. He said the remaining Marsa Power Station structures will be demolished and carted away next year.